Katrina was born in captivity on June 28, 1982. Although information regarding where Katrina was born, who her parents are, and how she was raised (by her mother or a human) was redacted from her files, it is known that she was born at SNPRC (Southwest National Primate Research Center) and taken from her mother the same day. At nine months of age, Katrina was transferred to the Laboratory for Experimental Medicine and Surgery in Primates (LEMSIP) in Tuxedo, N.Y. She was used in hepatitis experiments at LEMSIP for the next 14 years until she was transferred to the Coulston Foundation in New Mexico in January 1997 upon the closure of the New York facility. On Feb. 25, 2002, she was moved to APF. Katrina has been sedated or anesthetized at least 295 times in her life, with 268 of those anesthetizations at LEMSIP between March 20, 1983, and LEMSIP’s closure. She suffered through at least 36 liver punch biopsies during these years (on Jan. 16, 1985, her liver was punctured three times before a sample was obtained). Liver biopsies are performed by passing a stainless steel biopsy needle through the abdominal wall into the liver, after which tissue is aspirated. Chimpanzees subjected to liver biopsies are typically under anesthesia, but post-biopsy pain is common. In Katrina’s records there is no indication that any post-procedural pain relief was ever given. Between May 24, 1994, and Oct. 1, 1996, Katrina had four rectal biopsies, one cervical biopsy, vaginal washes, rectal swabs, and three lymph node biopsies, in addition to the liver biopsies discussed above. On Nov. 29, 1994, after waking up from ketamine, a dissociative anesthetic, Katrina “self-mutilated her left thumb.” Dr. Richardson notes that in his professional experience ketamine induces hallucinations and can cause emergence delirium and tendencies toward injuries, including self-mutilation. 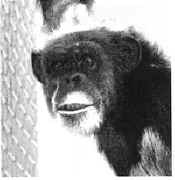 On Sept. 14, 2001, approximately five months before her transfer from the Coulston Foundation, Katrina’s record reported over-grooming, a behavior known to be abnormal in both wild and captive chimpanzees. Katrina has been infected with hepatitis B, hepatitis C, and HIV. Her elevated liver enzymes and low albumin indicate that her liver is diseased from one or more of these infections. Katrina’s use in experiments at SNPRC will cause more physical and psychological suffering, and her health will continue to deteriorate.